Western blot analysis of extracts from HT29 cells using eIF2B-epsilon Antibody. 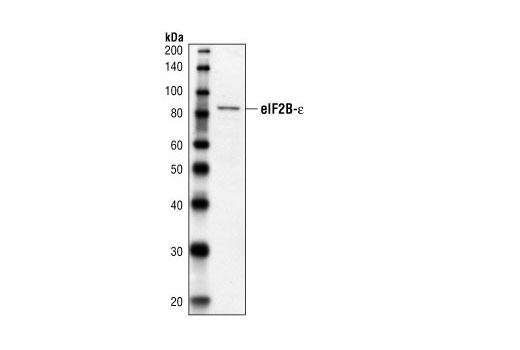 eIF2B-epsilon Antibody detects endogenous levels of total eIF2B-epsilon protein. Polyclonal antibodies are produced by immunizing animals with a synthetic peptide corresponding to amino acids near the middle of human eIF2B-epsilon. Antibodies are purified by protein A and peptide affinity chromatography. eIF2B, a guanine nucleotide exchange factor, is composed of 5 subunits, the largest of which is eIF2B-epsilon (7). Multiple in vivo phosphorylation sites have been identified on eIF2B-epsilon (8). Casein Kinase II can phosphorylate eIF2B-epsilon at Ser717/718 to allow for association with its substrate eIF2. Phosphorylation at Ser544 allows GSK-3 to phosphorylate the key regulatory site Ser540. A fifth eIF2B-epsilon phosphorylation site, Ser466, can be phosphorylated by casein kinase I.
Fabian , J. R. et al. (1997) J. Biol. Chem. 272, 12359-12365. Wang, X. et al. (2001) EMBO J. 20, 4349-4359.